Nick Younker delivers the goods! Duncan Criss is a writer. He reports stories that are deemed too crazy to be true. He writes on his online news site, but he can’t make enough money to live on. So, he takes on a second job at Legacy Mausoleums. He is hired on as the night security guard. He begins to see things. He gets closer and closer to the biggest news story of all time. Can he survive long enough to publish the article on his website? 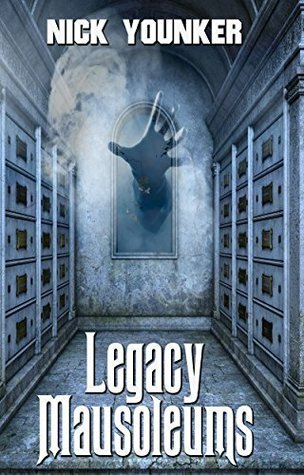 Legacy Mausoleums is a creepy short tale full of dread and ghosts. Mausoleums creep me out! I had to turn the light on halfway through this story. The story flows well and the characters are not shallow. Nick Younker does a great job of giving you just enough background to make the characters come to life. I didn’t see the ending coming at all! The ending was good, but it could have been better. This is my first time reading Nick Younker, but it won’t be the last!